When John sent this link last week we knew we had to go. 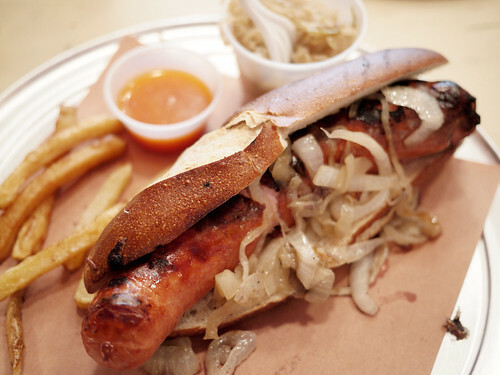 It was way too hot to eat massive sausages on pretzel rolls in a non-air conditioned space, but despite the intense food coma we all experienced afterward, the trip to newly opened Sausage Inc was worth it. M. and I split an artisanal hot dog and a blanco sausage. They were both divinely good. Really truly high quality sausages on a pretzel bun that only made the entire dining experience all that much better. The pretzel bun was not as heavy as we might have thought, but it was rather light and very complementary. with the Front Studio bunch. That I now eat my summer lunches alone? Peeps get busy, no biggie. And enjoyed our lunch together at Sausage Incorporated.